Shawnta Swindell works in USAA Labs remotely. "Actually, I don't use it often, but I need to use it more. 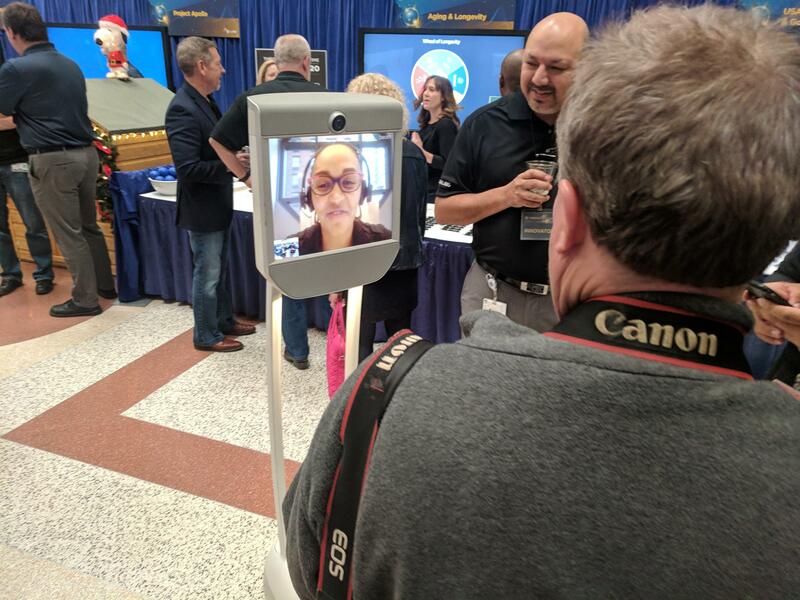 We use a lot of Skype,” said Swindell, gliding through exhibits in USAA’s headquarters with her beige, two-wheeled vehicle. The device, which looks like an iPad with a long neck, is the best way for her to see what her coworkers have created. "There's a lot more interaction,” she said. “And I can't participate or contribute to Innovation Day if I'm not actually, physically here with my robot." The day highlights employee innovations with awards, talks and booths that display more than a dozen projects. USAA’s 32,000 employees have contributed nearly 9,000 ideas on ways to improve and innovate this year. The company’s 170-person innovation department takes the concepts and helps develop them. They implemented 1,200 in 2017. USAA was the first bank to use smartphone check deposit. It rolled out access to crypto-currency Bitcoin wallets on its platform because its members are among some of the power users on Coinbase, a popular Bitcoin transaction site. The company now is trying everything from finding efficiencies through Blockchain, the public ledger that records and verifies transactions, to letting members use social media to access accounts. 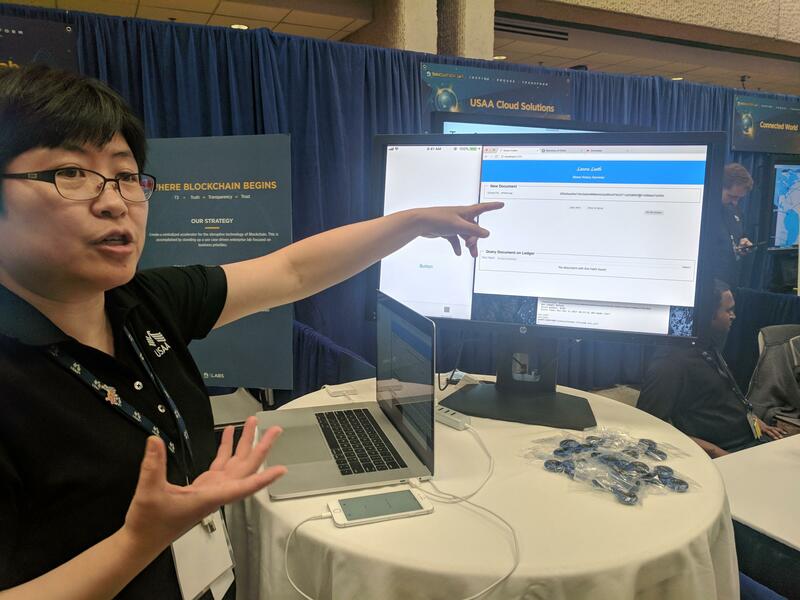 USAA research engineer Minya Liang explains how a company could use Blockchain to save time with official documents. Chief Innovation Officer Zach Gipson says USAA, which provides services to active military, veterans and their families, has to continuously innovate to serve its members because “we don't have a physical presence,” said Gipson, whose company serves customers worldwide. “So using technology to engage with members in new ways is critical to 100 years of history because there's not a local branch of USAA down the street." Now the company wants to be everywhere its members are. It recently added skills to the smart home device Amazon Alexa, and it is currently piloting automated chatbots through Facebook's messenger service. "What we did is, that interaction is wrapped in our secure container. You're going back and forth with USAA. Facebook doesn't have access to that information; they can't get it," Gipson said. If it rolls out, someone who checking their accounts once a month could easily check it every day. USAA itself is the product of innovation, starting as 25 Army guys wanting affordable auto insurance. Nearly 100 years later, it has more than $60 billion in bank deposits and nearly 12 million members today. The University of Texas San Antonio held its fifth annual Innovation Awards Wednesday. The 34 awards celebrated professors who have received patents and revenue from their research, the director of the Commercialization and Technology Transfer Office Christine Burke said.